Unsure for now, appears to be an UtaPri clone. After the first episode, I have mixed feelings for this. This anime has the potential to do well, but after one episode, it feels like it's trying too hard to Uta No Prince-sama. The main character appears to be a Haruka clone. The male characters seem bland and uninteresting. The closing song of the first episode seemed pretty good. I will see how the rest of the series progresses before passing final judgement. I made it about halfway through the first episode before giving up. It's not terrible, and the animation is slick, but none of the characters appealed to me. The opening animation was really the best part, and the rest wasn't worth watching. Given the size of the cast, it's to be expected that most of the harem characters might be one-note caricatures, but every single one of their personalities lack both individuality and impact; zero of them stand out. That's an interest killer for audience members who are looking for a hot guy to root for/drool over. Lastly, the main character is completely unrelatable, to the point where she's detestable. She's portrayed as nervous and anxious, which comes off as incompetent rather than sympathetic or endearing. It's impossible to root for her when she's given responsibility for the careers and livelihoods of idols that have clearly put all their passion into their work, when she seems to have all the motivation of a night shift convenience store employee. I LOVE THIS!! I love their singing. I LOVE EVERYTHING!! The plot and the idea of this show is awesome. However, one LITTLE thing that's probably not important..TOO MANY GUYS!! 10 SINGERS?!! Ah, whatever, just..plz tell me that 1 boy is gunna fall in love with the girl!!!! I just finished watching the first episode and it seems like a really average anime. It has a large cast so I don't expect much in terms of character depth. The main character seems like she is going to be a naturally gifted person which is why she was hired but she does not know any actual terms that basically anyone should be aware of... I mean how can you not know that take it from the top means "start from the beginning." I also noticed an error in the art during the first episode where the character with the pink highlight in his hair had the highlight go away in the middle of a close up (like it was there at 11:47 and once it gets to 11:49 it turns black for no reason until they cut away from him). So if you're watching it for the singing or idol aspects it could be okay but the plot looks generic and if the make an art issue that obvious in episode one I'd expect to see more errors later so I'm going to pass on this show. The Japanese music industry fascinates me,especially when it comes to Idols. So I might derive a little more from this anime then your typical viewer. B-Project is what it is. And what it is is a light, fluffy piece of j-pop cotton candy with extra sugary bishōnen eye candy. Don't expect anything deep or thought provoking. This is a shut the brain off and veg out while watching pretty boys dance around shirtless kind of guilty pleasure. 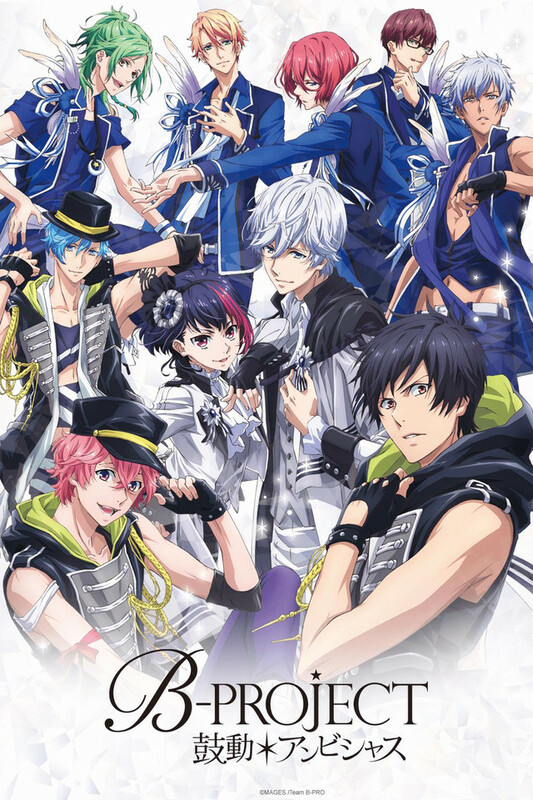 So if you like abs, men with pastel colored hair singing and dancing while wearing very low riding tight pants this is definitely the anime for you. These idol boys are absolutely PERFECT! I'm not gonna lie, after I watched the first episode, I was really 'eh' about it, but I kept watching initially because the boys were so dang pretty. Then as I kept watching it, the show just kept getting better and better. I'm writing this right before episode 11 comes out. The boys are actually very complex and the show helps you understand why they behave the way they do and why their insecurities are what they are. Yeah sure, some episodes are kinda dumb and only make sense within the context of anime, but if you're looking for a fun and easy watch with some nicely executed depth, then you should give this anime a shot. It's also super cute and funny! If you like Uta no Prince-sama (which is made by the same creator), then you're going to like this anime. There's plenty of music and the characters are very enjoyable and complex. Some episodes were a bit dumb, but it was still fun to watch. My only big complaint is that the final episode was rushed and felt out of place. Aside from that, I'd still like to have a second season. If you're looking for a fun, easy to watch anime, then give this one a try. I've seen a few shounen idol (boy idols) shows so the beginning of this wasn't very original or "new". Still, though, it had likable characters, good music, attractive animation/character design so it had everything it needed to be a good show. That was until the end, specifically the last episode. I won't spoil anything for people who feel the urge to watch it but they tried to cram a thrilling and dramatic plot into the last two episodes and the last one felt so rushed I'm STILL reeling from it. I highly, highly recommend you stay far away from this show because it will just upset you like none other. There are better idol shows out there. Many of them. Go watch those because they will not infuriate you at the end. Shounen Hollywood was good. There you go. More episodes, better story, same good song quality and hot boys to look at if you're into that sort of thing. Hopefully I just spared you the pain and suffering this show caused me. Gotta keep this cancer from spreading, after all.